The twenty three year long struggle of the Hillsborough families and supporters tells us much about life in a class divided nation. On one side was the working class represented by the Liverpool football fans whose City never forgot the disaster. 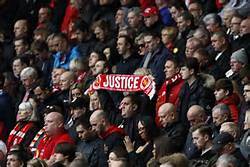 “Justice for the 96” chants have continued to ring out from the Liverpool Kop not least on each anniversary of the tragic events. Against them were ranged the powerful forces of the Crown supported by the Murdoch press. Hillsborough was a disaster waiting to happen. In those days working class fans were made to stand on terracing divided into “pens”. At Hillsborough they were ringed with blue-painted steel fences. Fans had to enter these through a small number of decrepit turnstiles. The capacity was officially 2,200; however it should have been 1,600. In addition the barriers did not meet the required official safety standards. On the fatal day Hillsborough did not even have a valid safety certificate. Over 3,000 supporters were let in. Simply blaming it all on the police does not get to the heart of the matter, but on the day it was they who were responsible for herding fans into a very dangerous place. At 2.50 pm the pens were already full before the police ordered the exit gate to be opened and around 2000 more fans were directed into the central areas behind the goal. The powerful and uncontrollable force of the crowd began crushing, injuring and then killing adults and children. Five minutes after kick off a crash barrier in pen three gave way, causing people to fall on top of each other. Worse was to follow: the emergency medical services were kept outside the ground with the exception of one ambulance driven on the pitch. Of the 96 people who died, only 14 were ever admitted to hospital. Forty one people were still alive at 3.15pm who could have been saved – they were left to die with little or no medical help. Over 700 were injured and thousands were damaged emotionally by what happened to them or those around them. Immediately the police and the Murdoch press pinned the blame on the Liverpool fans. Parents arriving to identify their children’s bodies were questioned as if they were criminals. The police tested the blood alcohol of people laid out dead. Checks were then run on them through the Police National Computer. Soon after stories began to circulate about the ‘animalistic’ behaviour of the fans. Four days after the disaster, the Sun newspaper published a story headlined “The Truth” alleging that fans had picked the pockets of victims, attacked and urinated on police and rescue workers. In 2004, Boris Johnson, the Tory’s favourite buffoon, continued the same line in the Spectator accusing Liverpool of wallowing in victim status and failing to acknowledge that drunken fans were partly responsible for the tragedy. In law a Corporate body is responsible for actions of its servants or employees. Individuals still have their responsibilities for actions or inactions but a corporate body cannot hide behind an individual and use them as scapegoat for collective responsibility. If you are bullied or endangered by an individual manager at work, it is the employer who is responsible even if the Chief Executive did not and cannot know every incident. Ignorance may mitigate but it is no defence. The Corporate Manslaughter and Corporate Homicide Act 2007 (CMCHA) states that an organisation is guilty of an offence if the way its activities are managed or organised brings a person’s death; and amounts to a gross breach of a relevant duty of care owed by the organisation to the deceased. In 1989 Crown immunity was a long established legal doctrine that meant that Crown bodies (such as Government departments) could not be prosecuted. The 2007 Act Section 11(1) now allows prosecutions. Whilst we should have no illusions in this law, it directs us straight to the top. The Crown is a corporate body, the most powerful multinational corporation in the country, but it is hardly mentioned in this terrible disaster. Nevertheless it is there lurking in the shadows directing operations throughout. It appears in various guises, that of the police, local authorities, civil servants, judges and ministers. Those in charge – the ‘controlling mind’ – are its ‘Board of Directors’ included the Chief Executive Officer, Margaret Thatcher and non-executive chair, Elizabeth Windsor. Although it appears in legal argument, in popular language it is referred to as the ‘Authorities’ or the ‘Establishment’. Any major crisis or disaster is a danger for the Crown. The Chief Executive or the Chair of the Board usually turn up in person to show who is in charge. Thatcher and Home Secretary Douglas Hurd arrived in Sheffield next day. The Queen may adopt a lower profile in such bad news stories. In 1966 she was criticised for not visiting the Aberfan disaster for eight days. Prince Charles and Diana Spencer were sent up to Hillsborough on the fourth day. Lord Justice Taylor was appointed immediately by the Home Secretary to conduct a judicial inquiry, the normal means by which the Crown protects itself. Thatcher was already pushing the Football Spectators’ Bill through Parliament in which membership cards would be brought in to control football fans. If Taylor proposed such cards then it would bolster the Crown’s own legislation and help the strategy to blame the fans not the police. Behind the scenes Taylor was pressed by the Home Secretary to fall into line on cards. Thatcher’s principal private secretary told her: “Lord Justice Taylor was distinctly unhelpful”. The Hillsborough disaster was not an isolated incident. In 1985 the Bradford City stadium fire killed fifty six. In 1987 the ferry, Herald of Free Enterprise capsized with one hundred and ninety three passengers and crew killed. The Kings Cross fire killed thirty one in 1987 and in 1989 the pleasure boat Marchioness sank in the Thames killing fifty one passengers. It was a time when the Crown embraced neo-liberal deregulation, slack regulation and no regulation at all. It was a public safety nightmare. The Crown at all levels was fully engaged in damage limitation. “Two judge led inquiries, an inquest, police investigations, and a private prosecution were carried out, but the families’ story was largely dismissed by the establishment.” (Independent on Sunday, Merrick and Brady, 16 September 2012). More than 160 police statements were changed. One hundred and sixteen of them were altered to remove “unfavourable” comments about policing. Norman Bettison played a vital role in the South Yorkshire Police unit covering their tracks. He was later promoted to Chief Constable and given a knighthood for his services to the Crown. South Yorkshire Police chiefs considered charging Lord Justice Taylor with perverting the course of justice. Taylor’s police driver claimed he heard the judge say the police would have to take the blame. Taylor’s job was to protect the Crown and if that meant sacrificing South Yorkshire police so be it. Otherwise responsibility would head up the food chain so enveloping the government. In 1996 the Labour Party in opposition promised the families a new inquiry. In office Home Secretary Jack Straw assured families of his support and asked Lord Justice Stuart-Smith for a “scrutiny of evidence”. The Judge concluded that fresh evidence did not add anything significant. Statements should not have been edited, he decided, but this was simply an “error of judgement”. Jack Straw accepted the findings and ruled out a new inquiry. Job done! Over ten years later the Crown opened some 450,000 documents for examination. Liverpool MP, Andy Burnham, closely and personally involved in the campaign for justice, credits this decision to Prime Minister Gordon Brown. Did Brown discuss this with the Queen in their weekly meetings and did she give the green light? If this was possible in 2009, why not in 1989? On 12 September 2012, Cameron apologised to the families for a “double injustice”. This represented official recognition on behalf of the Crown and the Queen as head of state. If the scandal continues to deepen, the buck will go beyond Downing Street and arrive at the gates of the Palace. What does the head of state do when such corruption occurs on her watch? What did the Queen know and when did she know it? What did her various Prime Ministers and Home Secretaries, like Howard and Straw, and senior civil servants know? Were they all part of this criminal conspiracy or simply ignorant and negligent? Were they, like so many sleeping beauties, fast asleep for twenty three years? Did she know or inquire or do anything? Don’t we, her subjects, have right to know? What we do know now is that the “Police, ambulance services, football authorities, stadium owners, local authorities, two judges and politicians all failed and failed again… Some in authority were not just defective but deliberately obstructive” (Independent on Sunday 16 September 2012). We can agree with Professor Ashton about context – a Thatcher government which hated the working class and despised Liverpool which had a militant tradition and opposed her policies. The South Yorkshire police played a major role in defeating the miners, so they were already her favourite police. Yet the South Yorkshire police, now caught red-handed in the commission of their crimes, are really a distraction and handy scapegoat. On 11th October 2012, the Crown Prosecution Service announced possible criminal charges. Their investigation will focus on Sheffield not Whitehall, Downing Street or Buckingham Palace. Don’t expect the Crown Prosecution Service to prosecute the Crown for corporate manslaughter or conspiracy to cover up this crime. Let Professor Ashton have the last word. “What happened at Hillsborough is a symptom of the corruption in public life that is endemic now. At stake is the vitality of our democracy”. That is a good place to unmask the Crown and change the secretive and unaccountable system of government.